Our first two days in Santorini have been pretty overcast and it’s even rained, nonetheless I’ve taken to the streets of Oia with my camera and I’m here to take you along with me. I hear the weather is going to cheer up for our last two days here, so hopefully I’ll have some more cheerful shots to share with you on my return. In case you didn’t see our previous announcement, after years of hosting the #TravelTuesday link-up, Bonnie has decided to step away from her position as host. Please join us in thanking her for her contributions over the years and wishing her all the best in her endeavours! 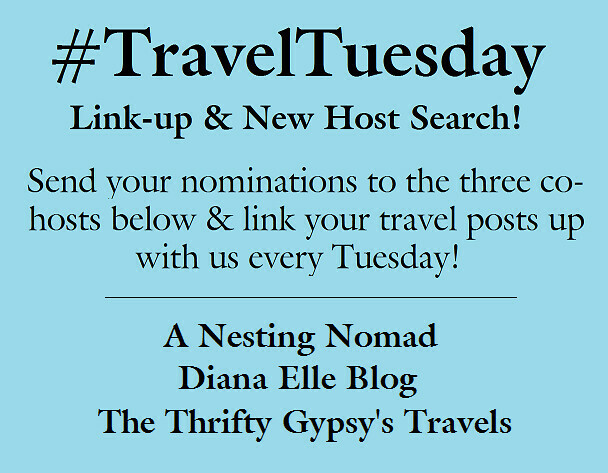 We’re looking for the next travel crazy, social media savvy, bigger-than-life personality to become the new host and new face of the #TravelTuesday link-up! Nominations for yourself or others are still being accepted prior to a vote which will be open for all to participate in selecting a new host! It so was. And the good thing was that it wasn’t too hot, so we could explore at will! I said hi from you, and promised you’d be paying a visit before too long. I hope you make it! Beautiful photos! I’ll be interested to hear your take on the island. I recently read where someone was underwhelmed by it after hearing so many great things. Your pictures are beautiful though!! It was sooo windy! My hair was one big knot by the time we got home, ha. And YES I so wish you could have joined me, tea with a view would have been amazing. Ahh, next time, right?! Even though it’s overcast, it’s still just so beautiful! The water is so blue, and everything is just perfect! I can’t wait to hear all about your trip! Absolutely gorgeous! I love the picture of you with your hair blowing! 🙂 And the water looks blue. Can’t wait to hear more about it and so glad you’re having a wonderful time! Haha! Always like to bring a dose of realism around here 🙂 The water was amazing, I wanted to just dive in the entire time. I’m back now and really sad about it, but I’ll be writing about my trip very soon! What a stunning place! One of these days I will make it there. Your photos are amazing. It was so beautiful. I really hope you do make it, it’s an incredible place and so unique. The colours are insane, right!? It’s a beautiful part of the world, I really hope you get to visit one day. I just loved the million shades of blue. Everywhere blue! If only my hair didn’t keep going in my face so I could have seen more…! Rachel, what a dreamy place. There is not excuse to stay inside. Keep having a great time. Dreamy is the right word. It was like something out of a storybook with all the different cool stuff they have on the island. I had an amazing break thank you, back to reality with a bump now! Ooh yes that looked gorgeous down there- we had a good look at it from up in the castle but didn’t make it down. Mostly because we ran out of time, but also because I saw the faces of the people who had just walked back up the stairs again…! Hah the wind was not my friend that day. The weather brightened up the day after so we had 2 days of sun which was amazing. Just in time for my birthday! Thank you weather! With the sun out it got really hot really quickly, it was just about manageable but I’m not sure how I’d have managed in the height of summer. Especially with the crowds. Anyway, I’m really glad you enjoyed your trip too, hopefully this brought back some good memories. High five for Santorini! Oh my goodness, Santorini looks amazing – even in grey weather! I’m absolutely dying to go there too!!! Just wish I had the time and money to do so already this summer!! Have lots of fun there! Yep, the cloud did nothing to dampen its beauty! It’s a stunning place, I really hope you get to visit one day. It’s expensive though, that’s for sure :/ I’m back now and I miss it already! Thank you! The good news is it brightened up the very next day so I could get back out with my camera with renewed vigour. And suncream. Everything was even more beautiful, if that can be believed. Would like to see more of Santorini;)! Never fear! There’s plenty more coming your way 😀 You’ll be wishing for them to stop before too long! I love the blue doors, too. Blue is my favourite colour (in case you hadn’t already guessed) so I was basically in paradise the entire time. gorgeous pictures! so jealous and i kinda dislike you right now. okay just kidding. I found lots more kitties, they were all adorable. And quite a few puppies, too! Which were also cute, and may have benefited from some of my lunch 🙂 It’s ok, I kinda dislike myself right now. Actually I really didn’t like myself when I was trying to brush the knots out of my hair after taking that last photo…. It is! It’s like a film set or something, with everything beautifully composed. You can literally just point your camera anywhere and end up with a masterpiece. It’s out of this world. I had a brilliant time, thank you! You have got such great photos! I had a giggle at the hair one though, have one of me like that on a really windy day on the great Ocean road. I wasn’t going to miss the opportunity to have my photo taken there, even though you can’t really tell it’s me with the hair everywhere, ha! Love your photos..what a beautiful spot and I love the kitty !! Thank you! The kitty was adorable. It just sat in a high traffic area, constantly being petted by passing tourists. Not a bad life! Yes! That pink tree was amazing. We had to go back again for more pictures of it. The water was amazing, I would have wanted to swim all the time except it’s pretty hard to get to down the cliffs! The bougainvillea just brighten everything up so much, even though it was a gloomy day. And a windy day… Didn’t really spoil the beauty at all though. It’s an incredible place. The white contrast with the colours really makes it, doesn’t it?